SAUBER DRIVER MARCUS Ericsson walked away unscathed from a nasty crash at 220 mph in the second practice round at the Italian Grand Prix. Ericsson was beginning his first hot lap of the session when his Sauber dramatically twisted sideways into the barriers before sliding and then flipping across the grass before the Rettifilo chicane. The car was heavily damaged, but the Swede was able to clamber out of the car and return to the pits. Luckily for the 27-year-old, he was protected by the Halo safety device after an apparent issue with the rear wing. The session was immediately stopped and Ericsson was cleared to continue after tests at the track’s medical centre. The Halo safety device has polarised opinion in the paddock since its introduction at the start of the season, but proved its worth at the weekend. 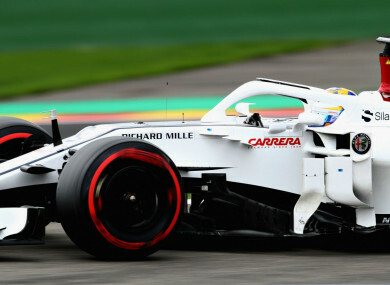 Ericsson’s Sauber team-mate Charles LeClerc was grateful for Halo in Belgium as it ensured the tyres of Fernando Alonso did not connect with him in the cockpit following a first corner shunt from Nico Hulkenberg. Tyre marks on the halo showed its value and brought praise from all quarters, and its importance was evident again during FP2 at Monza. Additional reporting by Sinéad Farrell. Email “Ericsson walks away unscathed after 220 mph crash in Italian Grand Prix practice round”. Feedback on “Ericsson walks away unscathed after 220 mph crash in Italian Grand Prix practice round”.